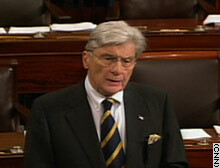 Sen. John Warner of Virginia announces DP World's decision Thursday on the Senate floor.  E-mail us: What was the controversy about?  TIME.com: Inside Dubai Inc.
Do you approve of how legislators handled the port security issue? WASHINGTON (CNN) -- United Arab Emirates-owned DP World said Thursday it would transfer its operations of American ports to a "U.S. entity" after congressional leaders reportedly told President Bush that the firm's takeover deal was essentially dead on Capitol Hill. "Because of the strong relationship between the United Arab Emirates and the United States and to preserve that relationship ... DP World will transfer fully the U.S. operations of P&O Operations North America to a United States entity," Edward H. Bilkey, DP World's chief operating officer, said in a statement. The UAE firm's purchase of P&O, the British company that manages cargo and passenger terminals at several ports on the Atlantic and Gulf coasts, has stirred up bipartisan opposition. A source involved in talks between the White House, Congress and DP World said the exact meaning of the UAE firm's statement is unclear, in part because the details of the transaction have not been worked out. A source told CNN that the White House believes DP World's American assets would be sold to a U.S. firm. White House spokesman Scott McClellan said the move was solely the "company's decision," adding that "the UAE's decision reflects their understanding of the importance of the broader relationship and of continuing to work to strengthen it." Treasury Department spokesman Tony Fratto said DP World's willingness to work with Congress and address its concerns were appreciated. "We expect DPW to provide further specific details on the company's decision and its intentions going forward," Fratto said. "Treasury staff are communicating with the company on these details." Treasury Secretary John Snow is chairman of the Committee on Financial Investment in the United States, which initially approved the transfer of P&O assets to DP World. Because of sparse information about the transaction, Senate Democrats reacted cautiously to the company's announcement and continued to press for a Senate vote that would kill the deal. "If the U.S. operations are fully independent in every way, that could, indeed, be promising," said Democratic Sen. Charles Schumer of New York. "If, on the other hand, there is still ultimate control exercised by DP World, I don't think our goals would be accomplished, and obviously, we'll need to study this agreement carefully." The Senate rejected a procedural move by Majority Leader Bill Frist, a Tennessee Republican, to prevent a vote on an amendment offered by Schumer that would block the deal. Republican Sen. John Warner of Virginia, who had been working to craft a compromise, on Thursday announced the move by DP World on the Senate floor. Earlier Thursday, Senate and House leaders warned Bush that the UAE deal was a lost cause, GOP sources said. House Speaker Dennis Hastert, an Illinois Republican, and Frist delivered the news to Bush during a meeting at the White House, the sources said. The leaders told the president they would pass measures to block the deal by veto-proof majorities, sources said. Bush had threatened to veto any legislation that stopped the deal. Bush has said any effort to stall or kill the deal would strain ties with a vital Arab ally in the war on terrorism. On Wednesday, the House Appropriations Committee voted 62-2 to insert an amendment into a $68 billion emergency supplemental funding bill for military actions in Iraq and Afghanistan. The issue marks an unusual rift between Bush and congressional Republicans, who say they have received overwhelmingly negative comments from constituents. The committee's approval was bipartisan, with Reps. Jim Moran, a Democrat of Virginia, and Republican Rep. Jim Kolbe, of Arizona, casting the only votes against it. Tensions between Bush, whose approval rating is near an all-time low, and Congress have been growing for some time, and the president's vow to veto the legislation angered many of his congressional allies. CNN's Dana Bash, Ed Henry, Suzanne Malveaux and Deirdre Walsh contributed to this report.